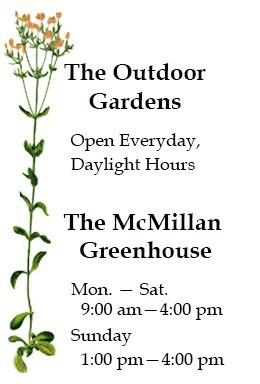 UNC Charlotte provides five free parking spaces adjacent to the McMillan Greenhouse for gardens, greenhouse visitors. These spaces are in Lot 16A. You may park in one of these spaces Monday – Friday if you sign the sign in sheet inside McMillan Greenhouse, and note your license plate number. Take exit 46 East, Mallard Creek Church Rd. (from 85 South that’s a left; from 85 North that’s a right). At the third stoplight (about 1.5 mi.) turn RIGHT on Mary Alexander Rd. (marked also as Bonnie Cone in the other direction). You will enter campus, and at the stoplight, continue straight. The next road to the RIGHT (only) is Craver Rd. Turn right onto Craver Rd. and then take a quick right into the PATS parking lot. Take exit 32 (Hwy. 29) off I-485. Head west on Hwy. 29, Tryon St. (from I-485 North, that’s a left; from I-485 South, that’s a right.) The next main intersection past I-485 is at Mallard Creek Church Rd. Take a LEFT onto Mallard Creek Church Rd. At the next stoplight, turn RIGHT onto Mary Alexander Rd (marked also as Bonnie Cone in the other direction). You will enter campus, and at the stoplight, continue straight. The next road to the RIGHT (only) is Craver Rd. Turn right onto Craver & take a quick right into the PATS parking lot. 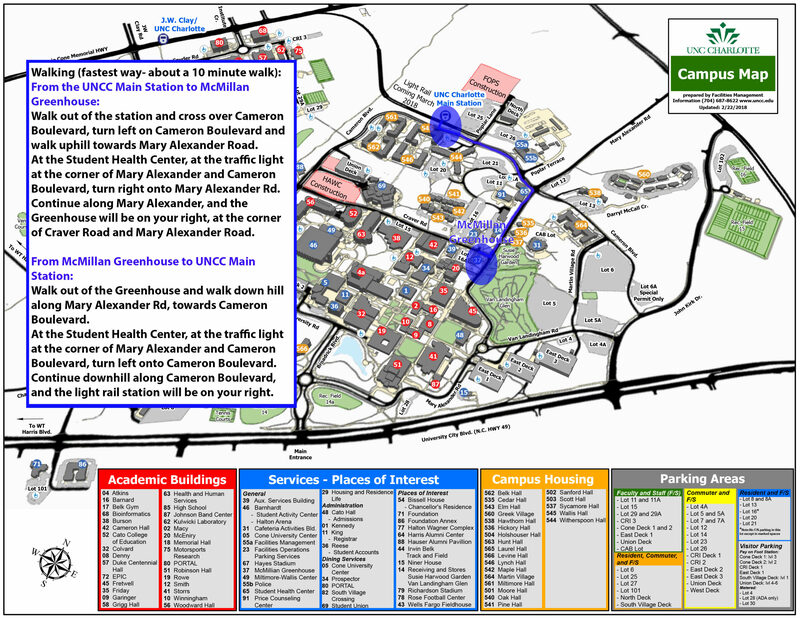 The Botanical Gardens are on the east end of the campus at the corner of Mary Alexander & Michael Craver Rds. 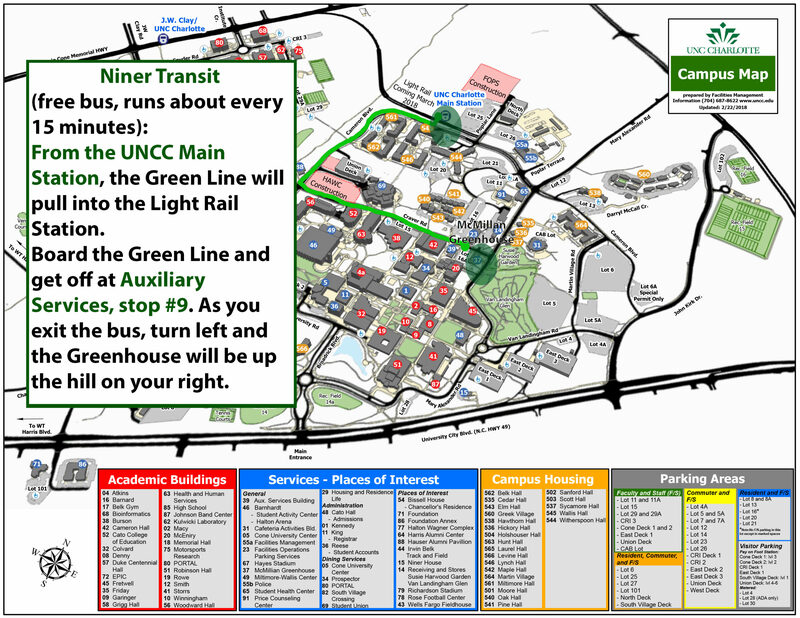 If you would prefer to enter the campus via the main entrance, but wish to visit the greenhouse, look on the directional kiosks and signs for “gardens or greenhouse” and follow the arrows. 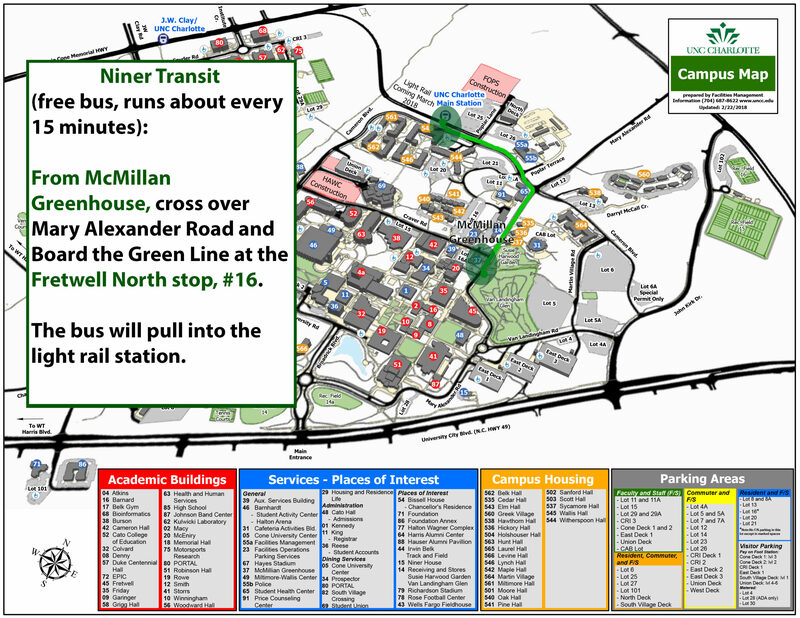 Click here for directions to the main campus entrance. Walk out of the station and cross over Cameron Boulevard, turn left on Cameron Boulevard and walk uphill towards Mary Alexander Road. At the Student Health Center, at the traffic light at the corner of Mary Alexander and Cameron Boulevard, turn right onto Mary Alexander Road. Continue along Mary Alexander, and the Greenhouse will be on your right, at the corner of Craver Road and Mary Alexander Road. Walk out of the Greenhouse and walk down hill along Mary Alexander Rd, towards Cameron Boulevard. At the Student Health Center, at the traffic light at the corner of Mary Alexander and Cameron Boulevard, turn left onto Cameron Boulevard. Continue downhill along Cameron Boulevard, and the light rail station will be on your right. From the UNCC Main Station, the Green Line will pull into the Light Rail Station. Board the Green Line and get off at Auxiliary Services, stop #9. As you exit the bus, turn left and the Greenhouse will be up the hill on your right. From McMillan Greenhouse, cross over Mary Alexander Road and board the Green Line at the Fretwell North stop, #16. The bus will pull into the light rail station.